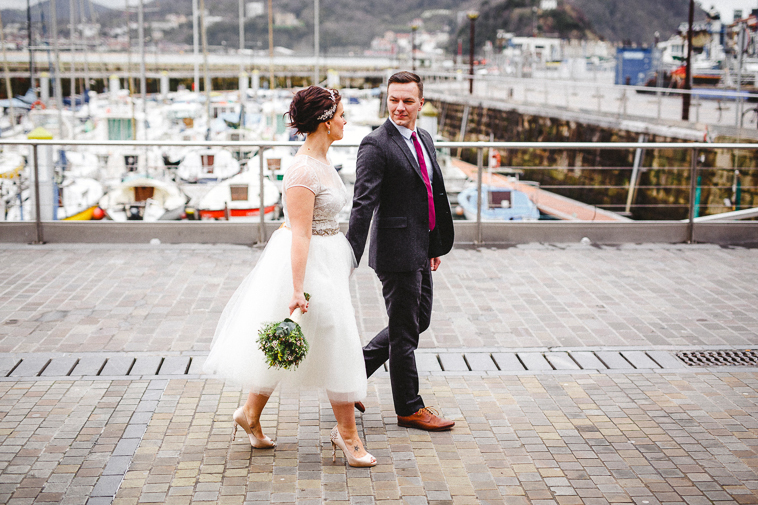 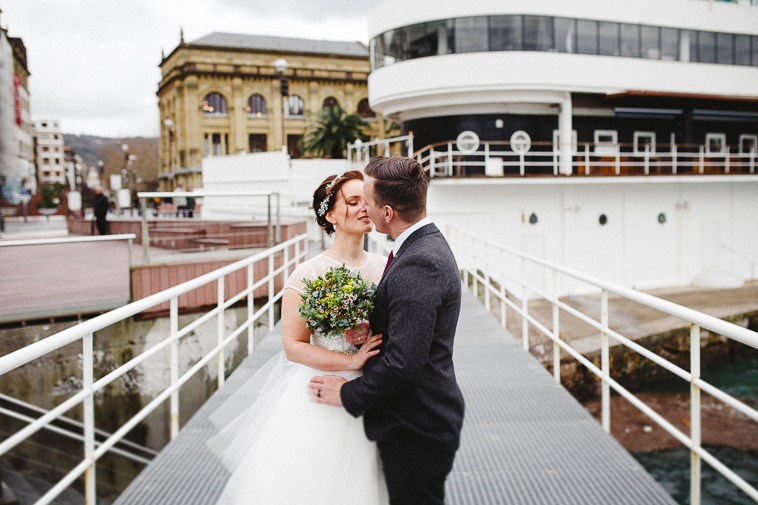 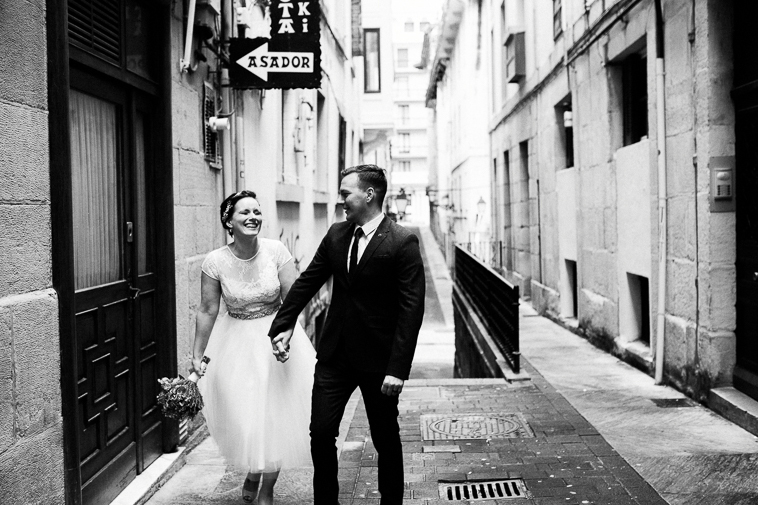 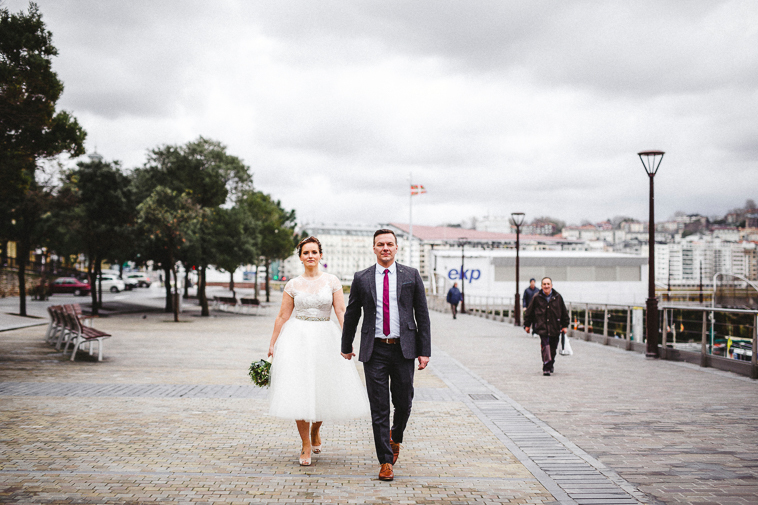 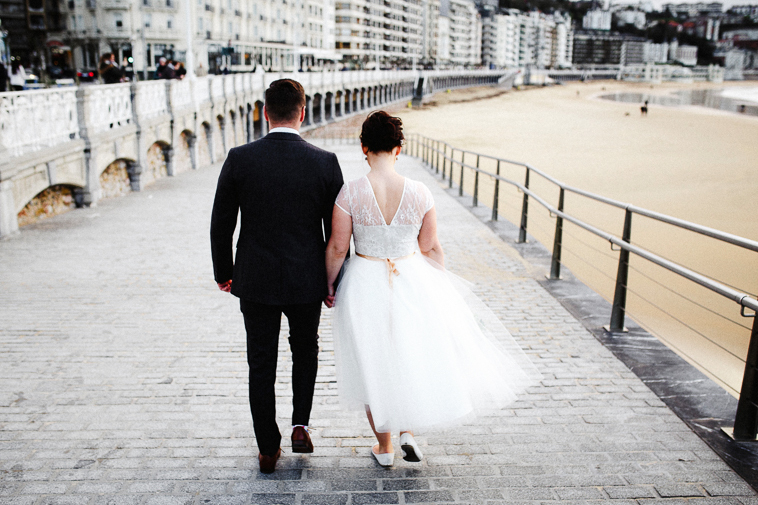 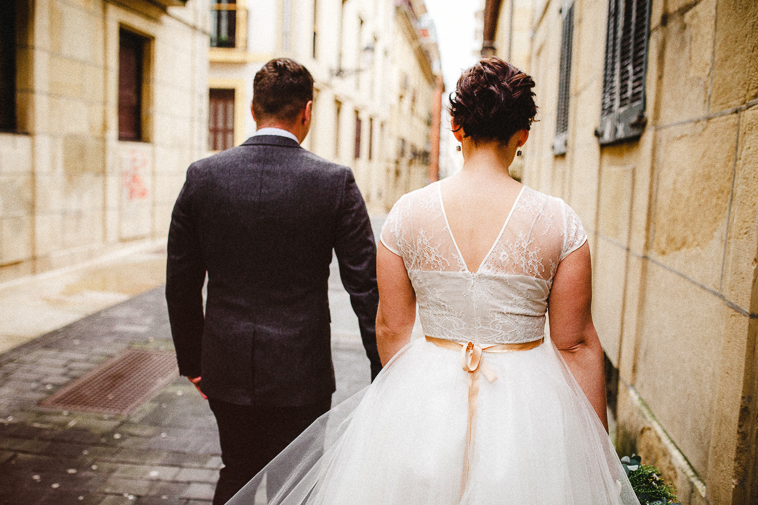 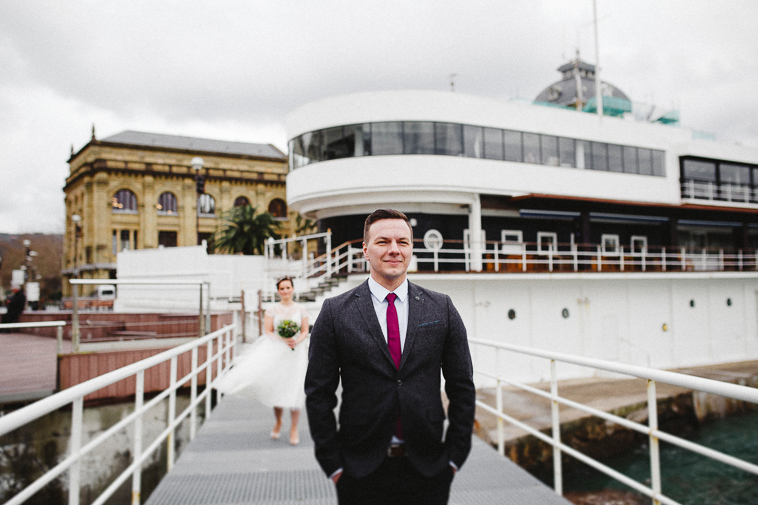 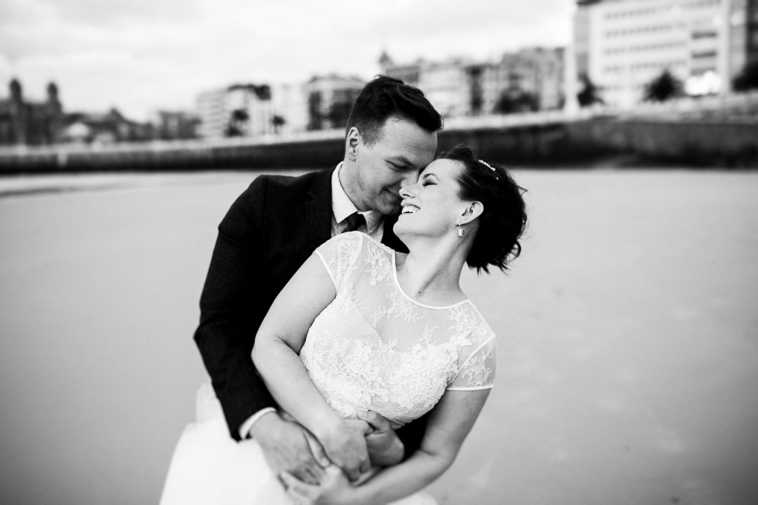 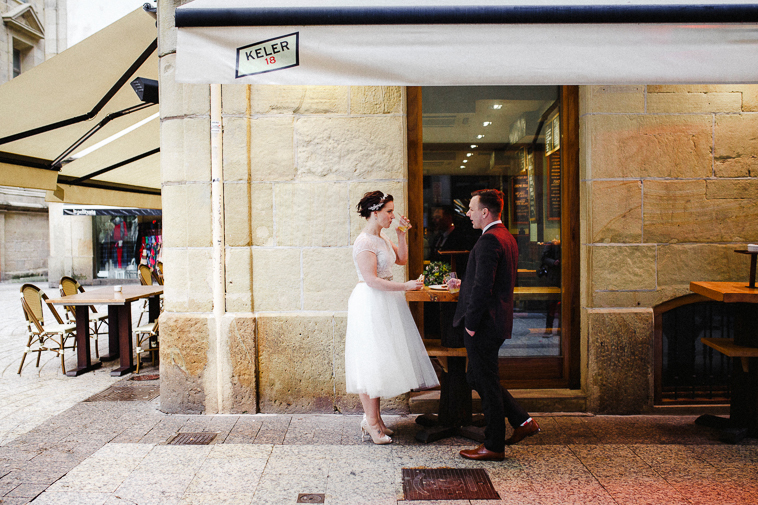 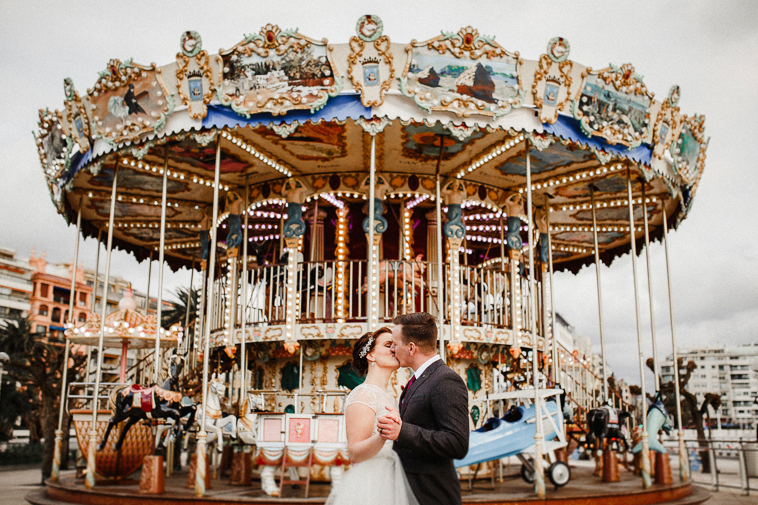 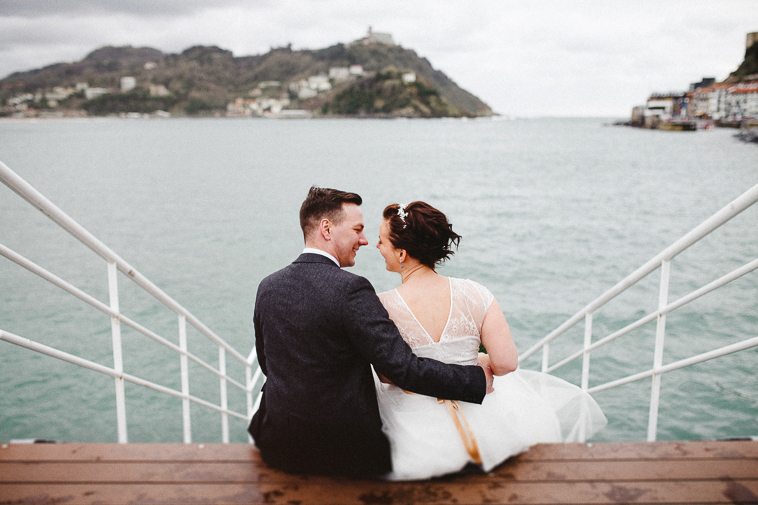 As destination wedding photographer in San Sebastian, we love couples who choose this marvelous city as their wedding destination. 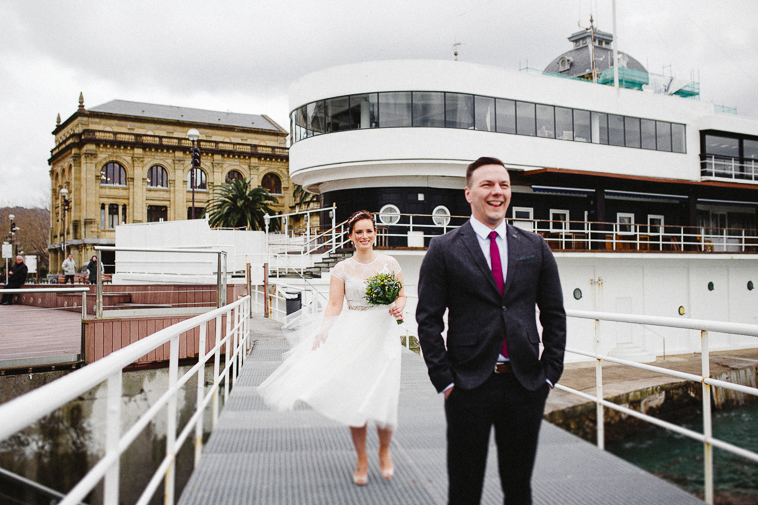 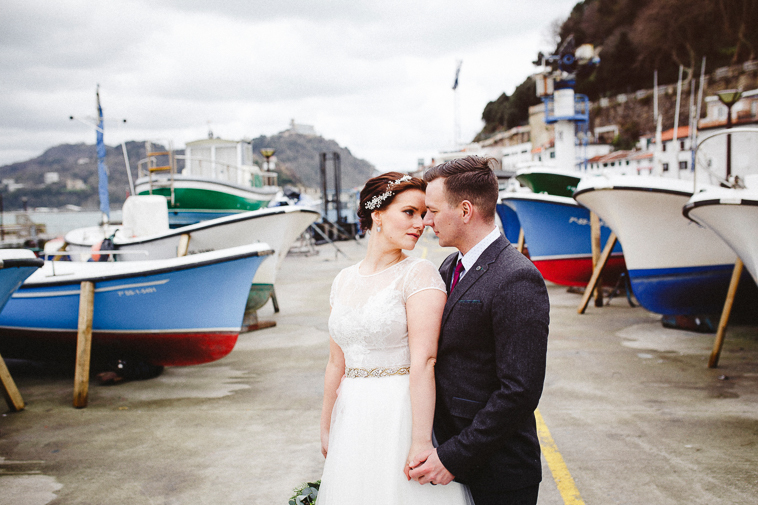 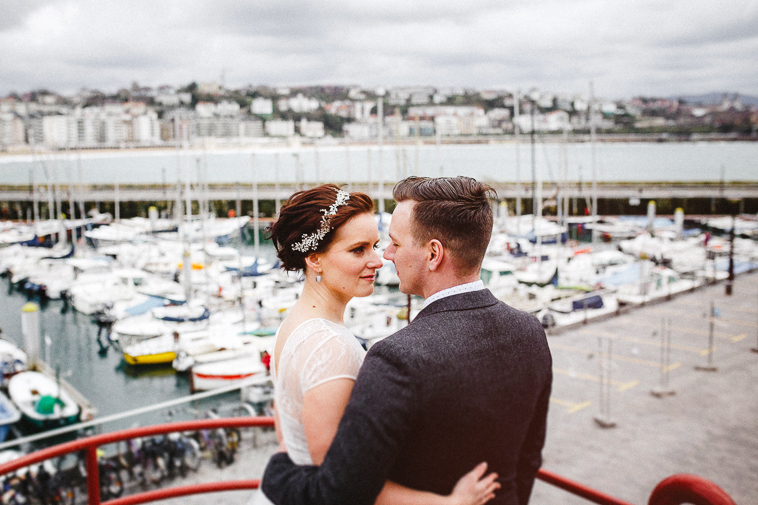 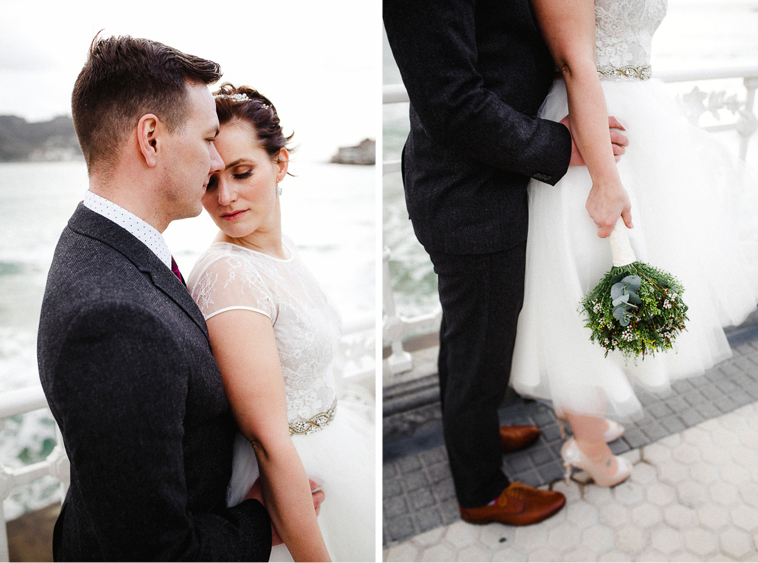 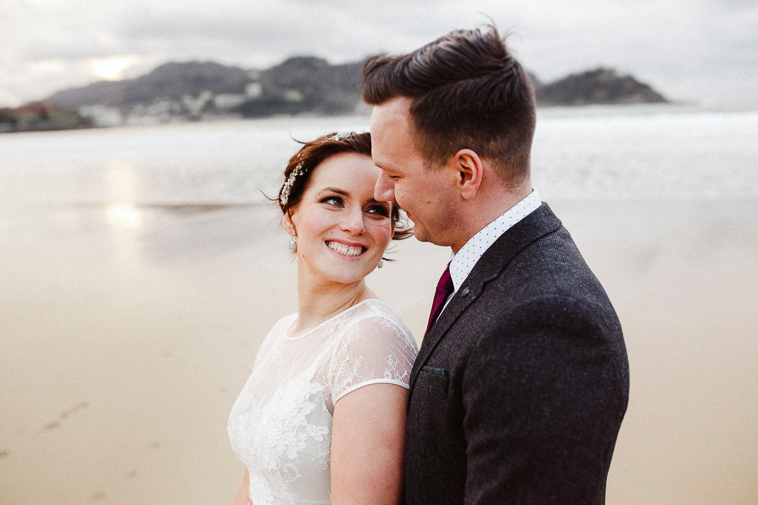 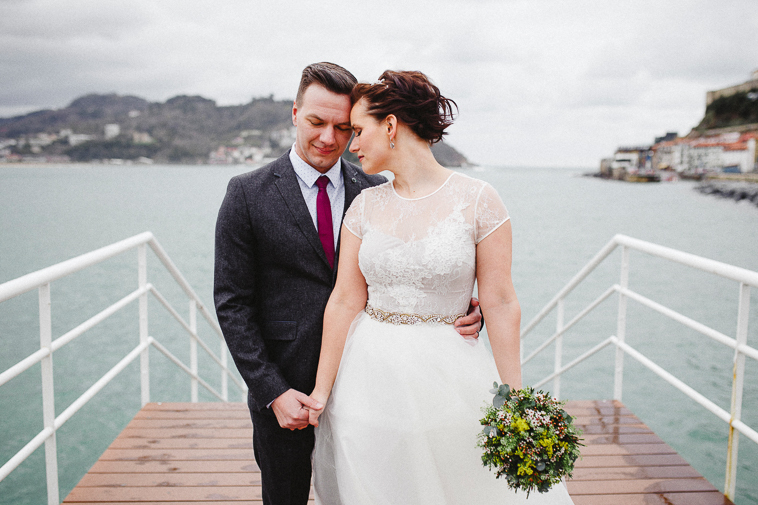 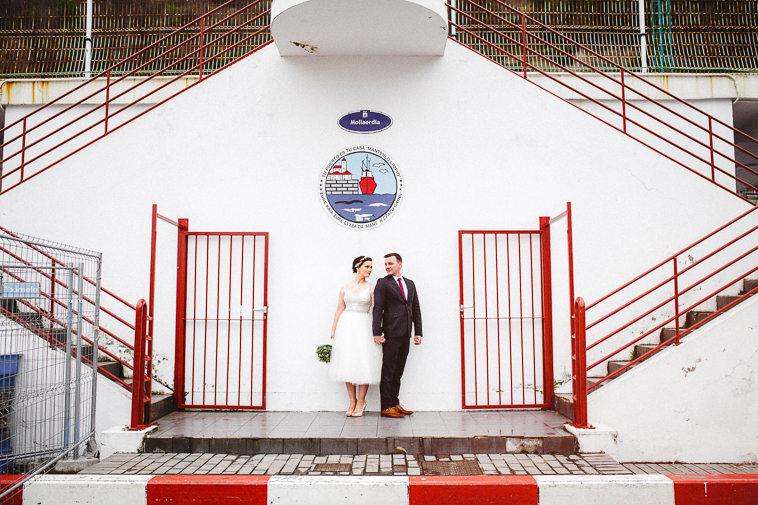 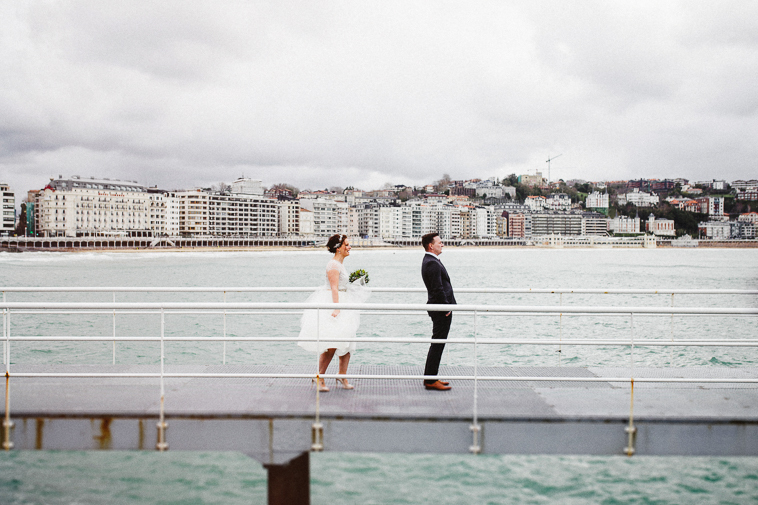 Kelly and Shawn came from Canada to celebrate their wedding in San Sebastian. 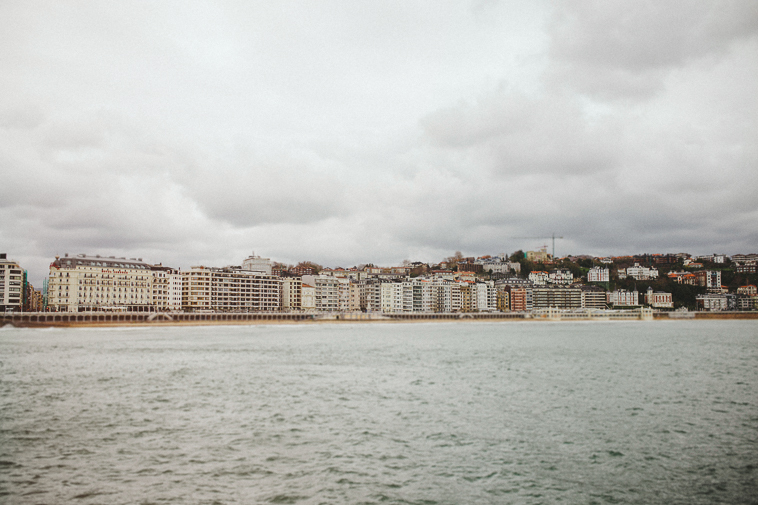 They had already visited the Basque Country and they fell in love with the landscape, the people and the deep respect they have for local products and traditional methods. 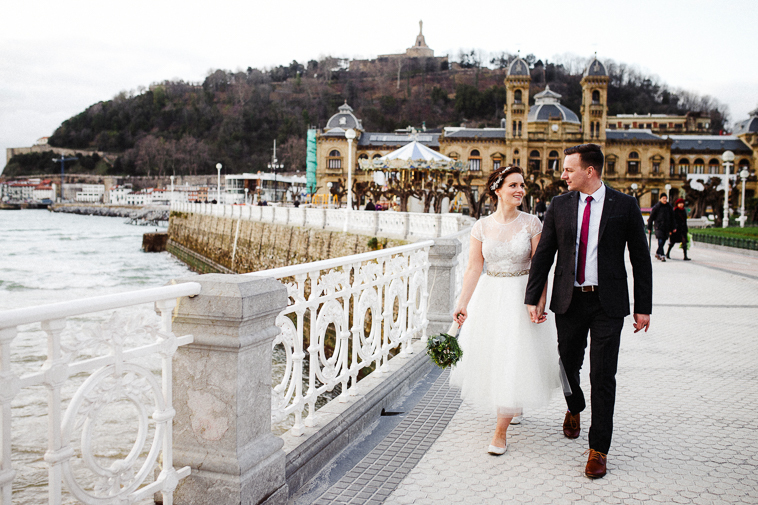 As basque product importers in Canada, they decided to have their ceremony in a cider house but before this, they took a walk in San Sebastian with us. 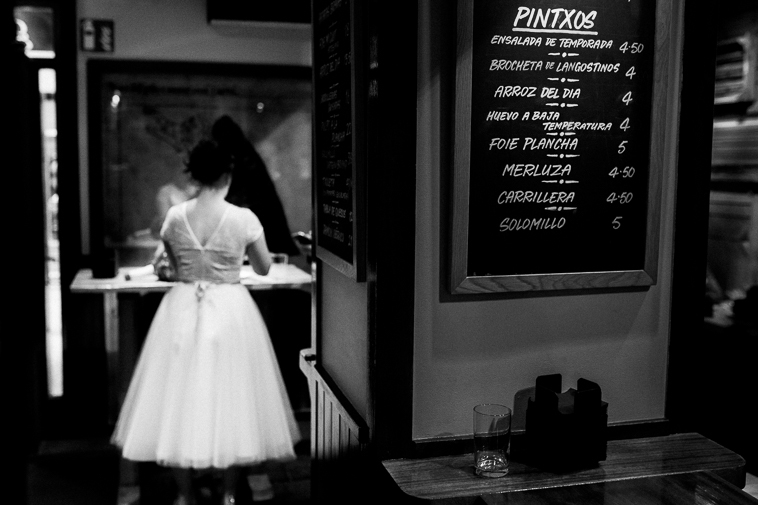 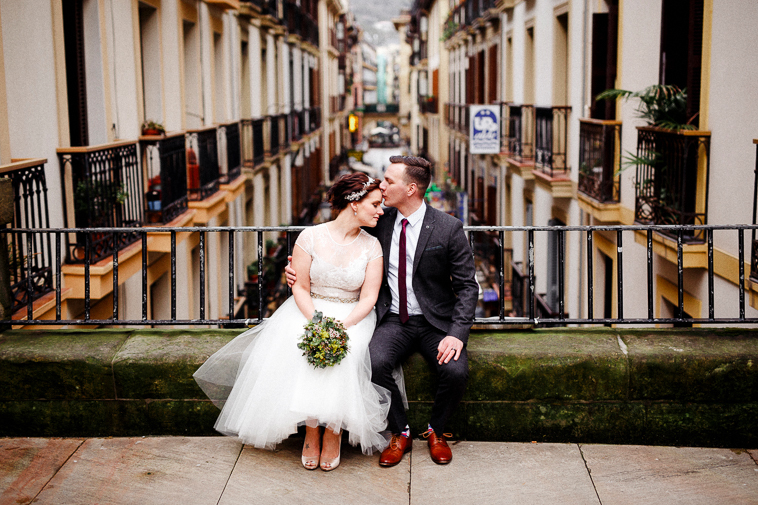 We started by capturing their «First Look» at each other as they made their way down to the seaport continuing in the old town by tasting traditional “Pintxos” with a glade of cider. 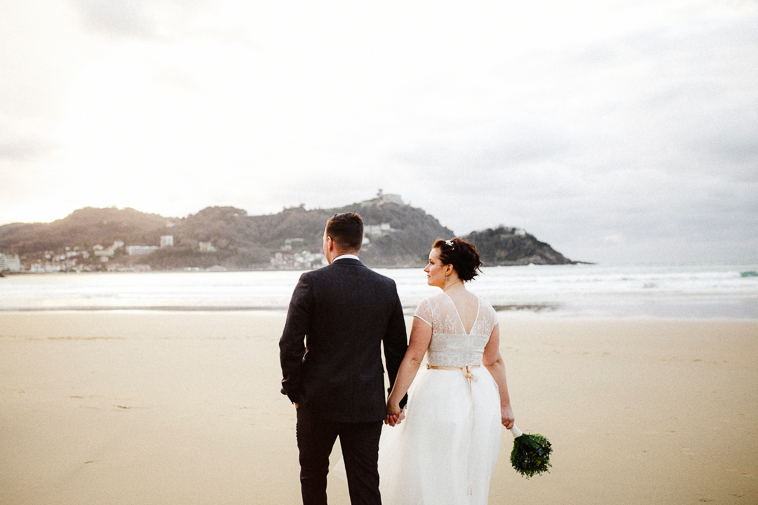 The shooting finished on the famous Concha Beach with an amazing sunset. 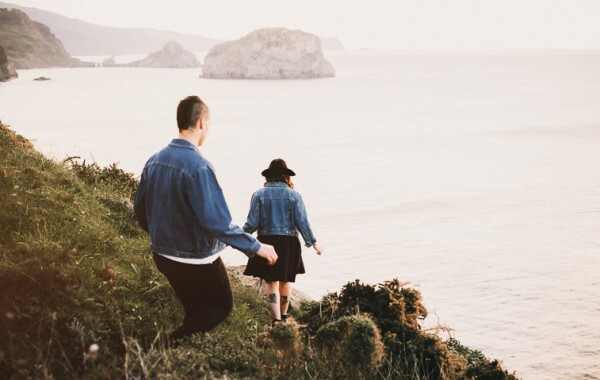 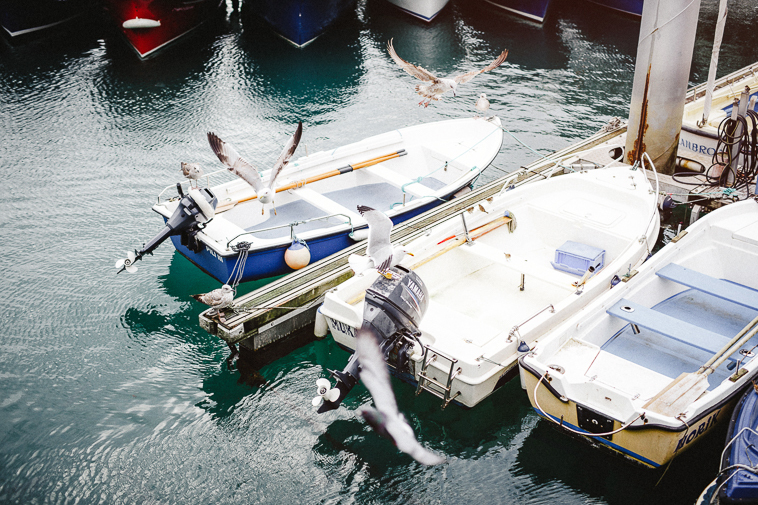 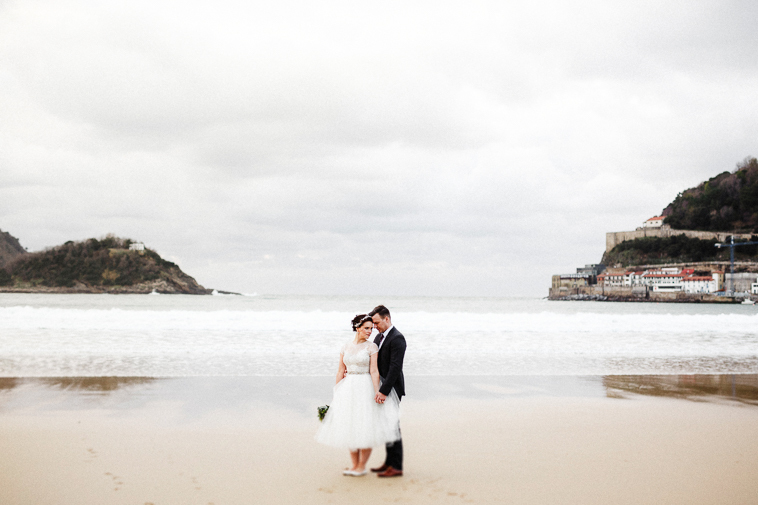 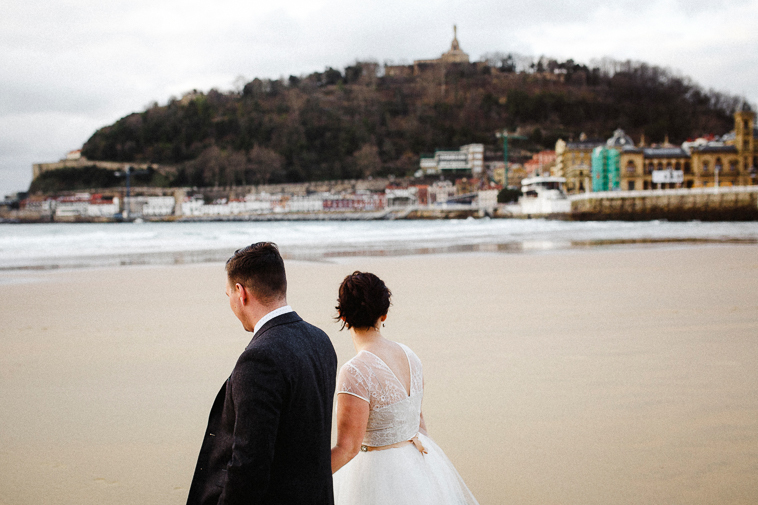 Don’t you think it´s a fantastic idea to have a couple session in San Sebastian while you are visiting the city? 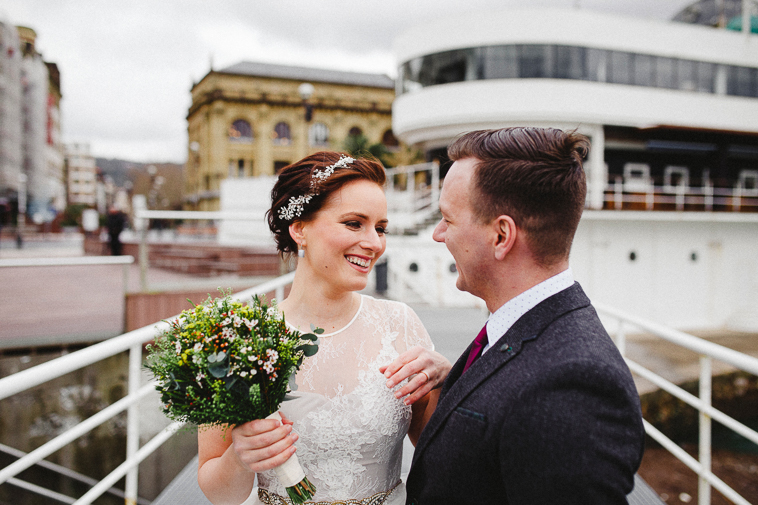 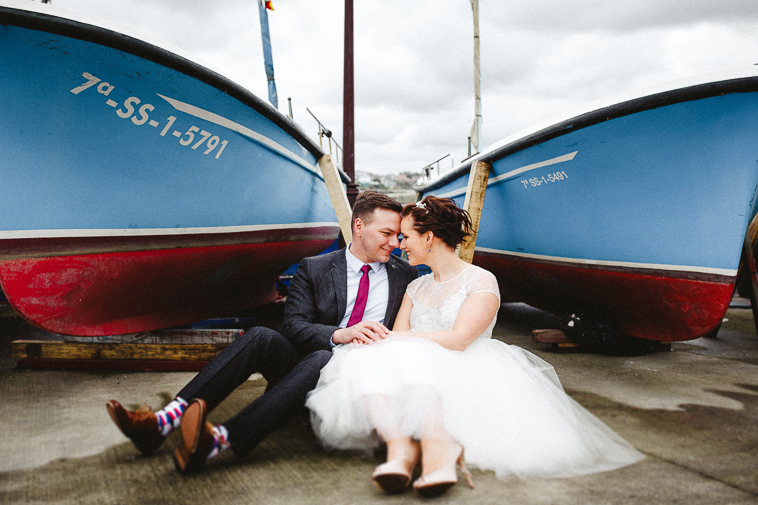 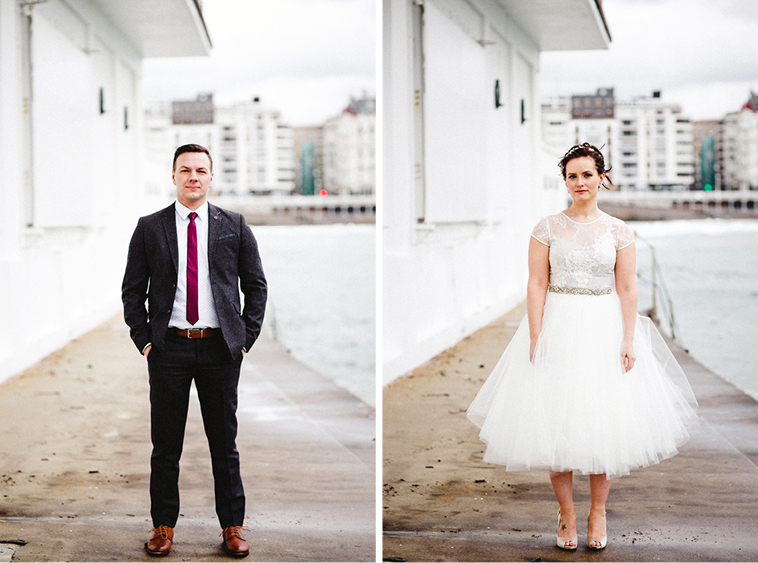 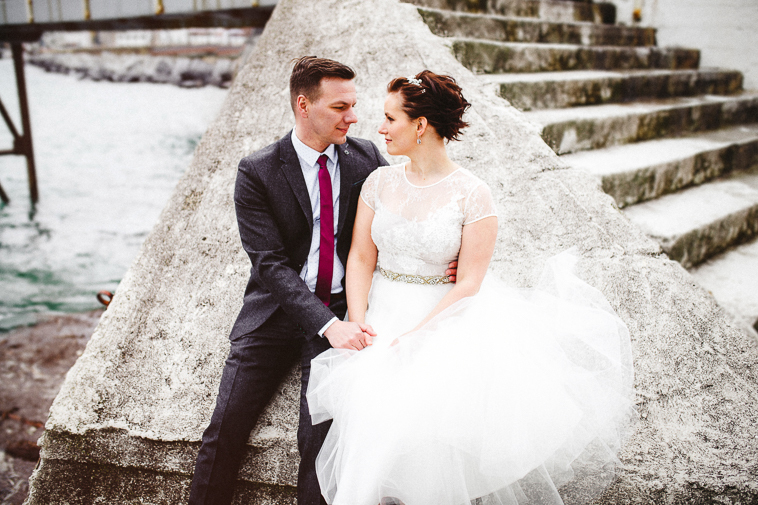 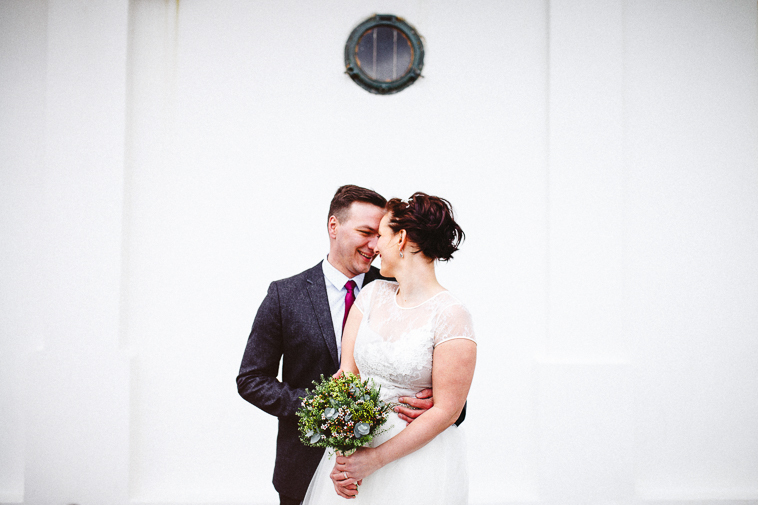 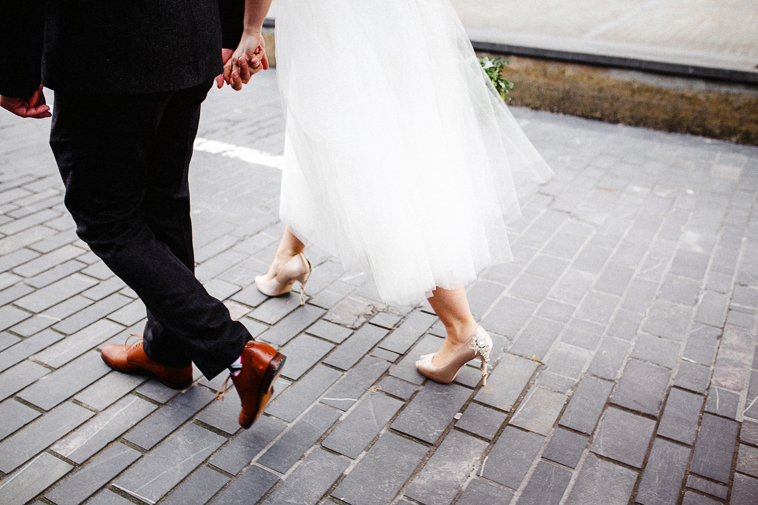 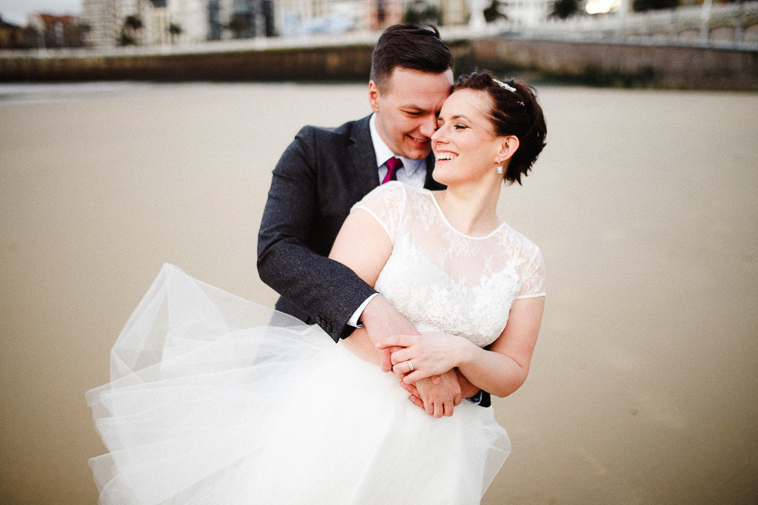 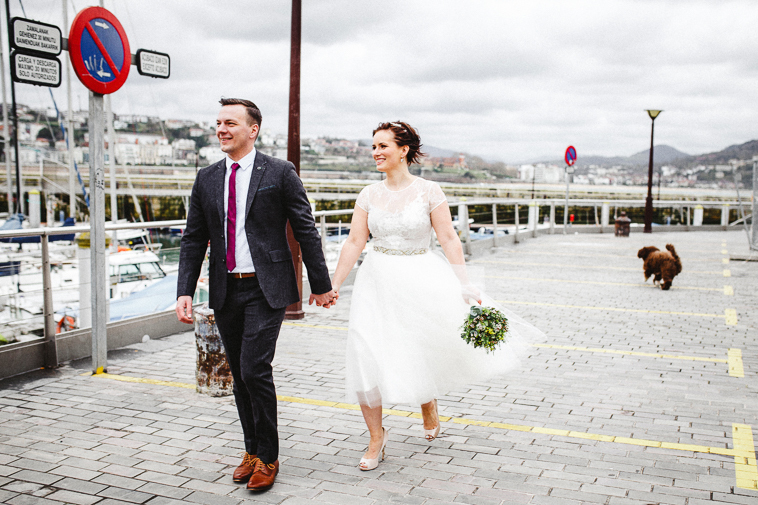 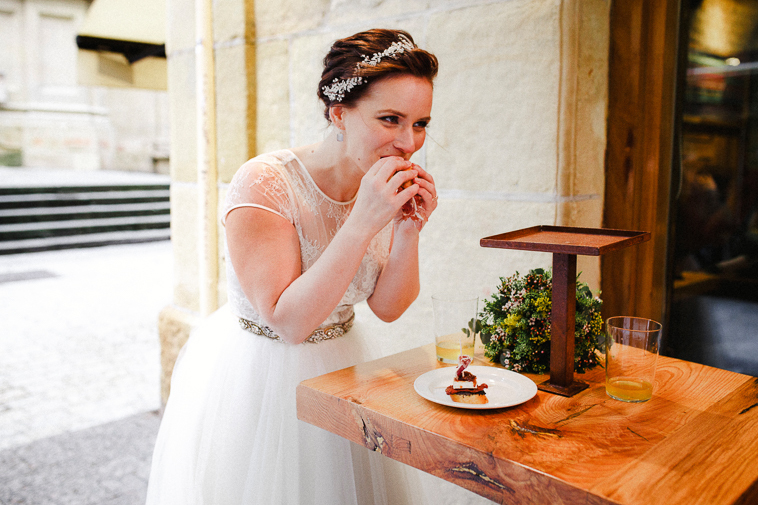 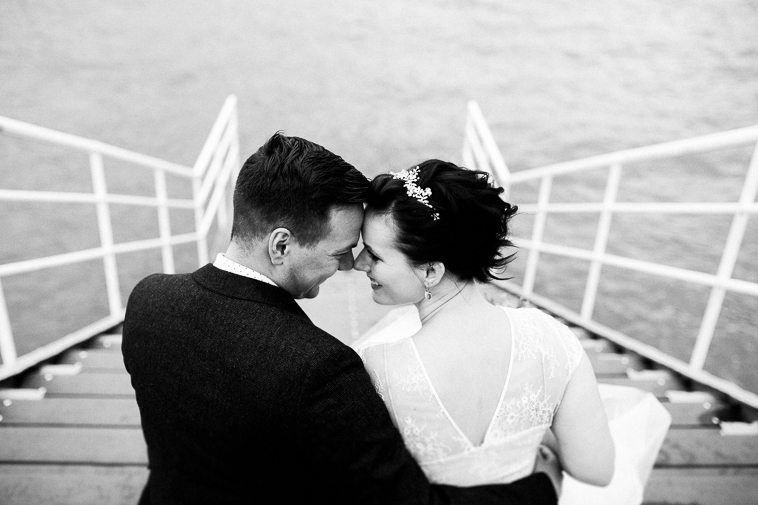 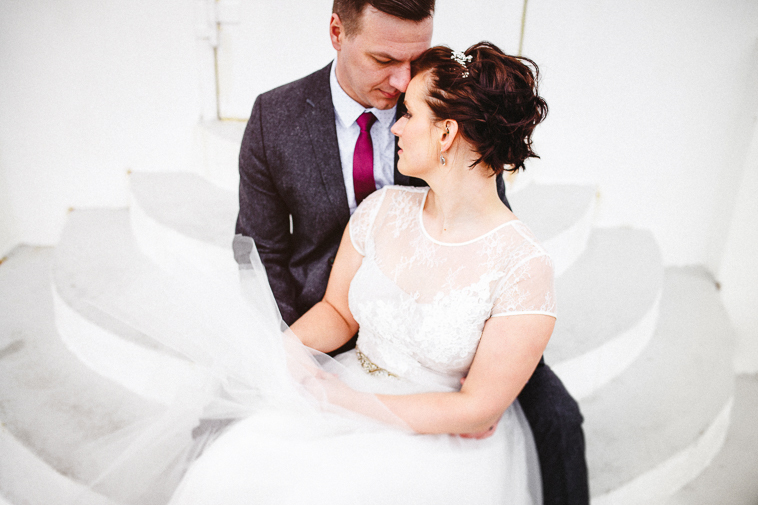 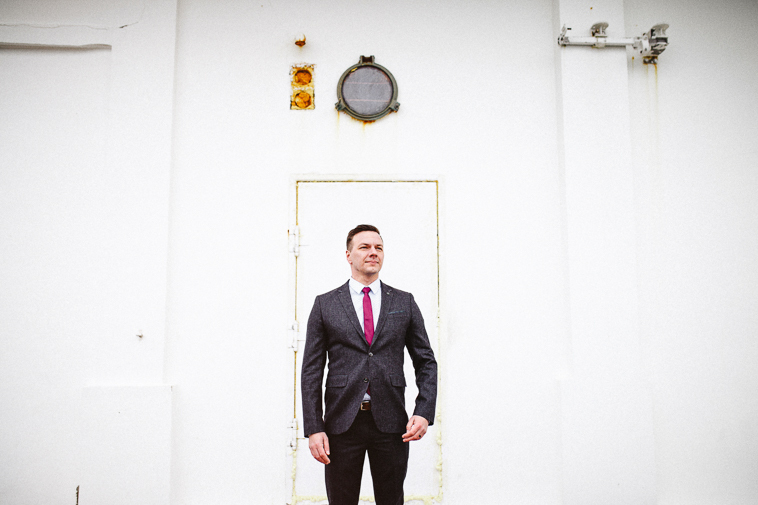 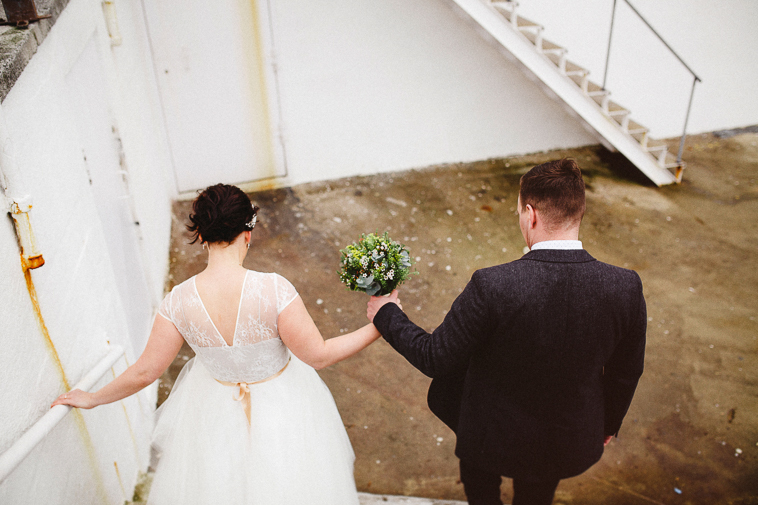 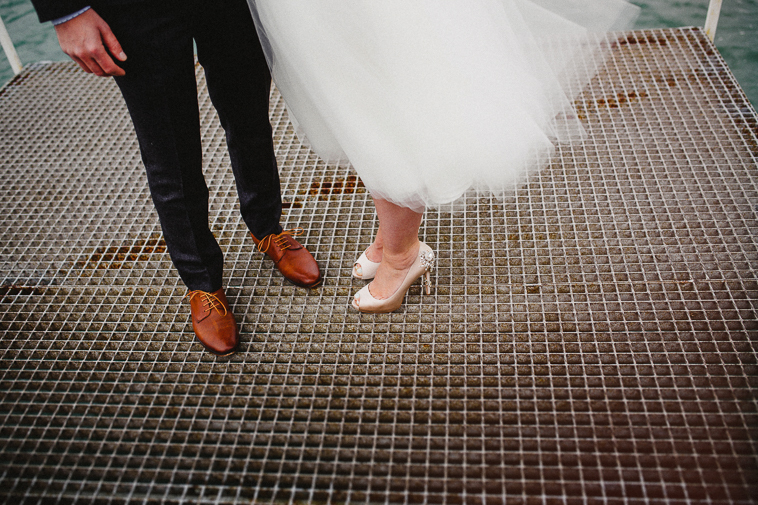 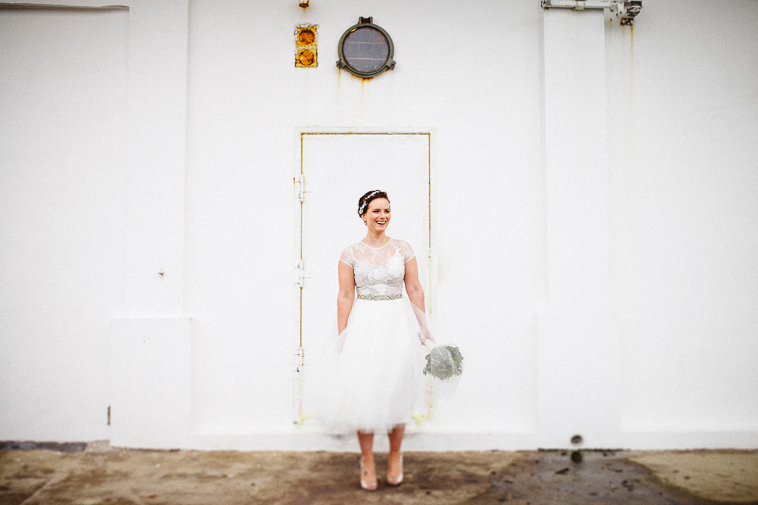 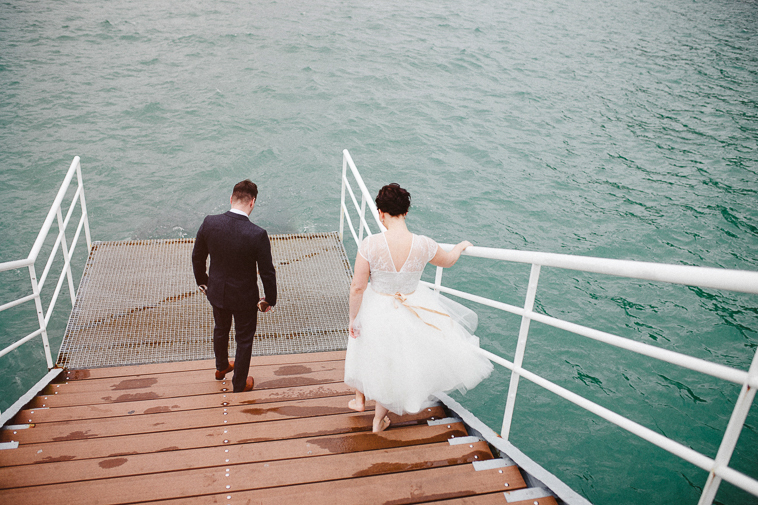 Kelly’s midi wedding dress is from BHLDN in Seattle and is made by Nha Khnah. 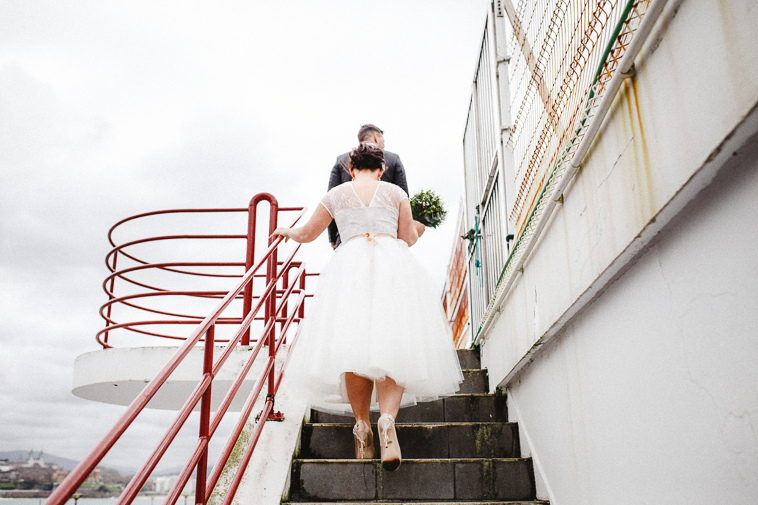 Her headdress is from Davie&Chiyo and the shoes are from Badgley Mischka. 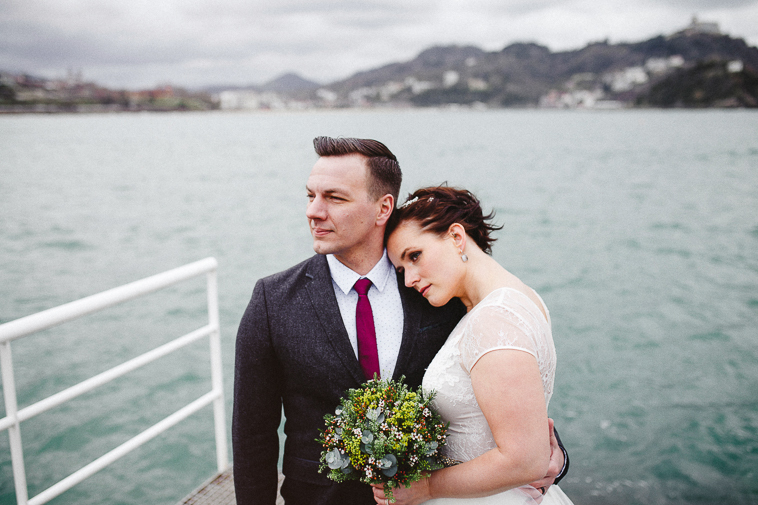 The wedding bouquet is from Mimiku, a flower shop in San Sebastian and the make up and hair were done by 90 Grados. 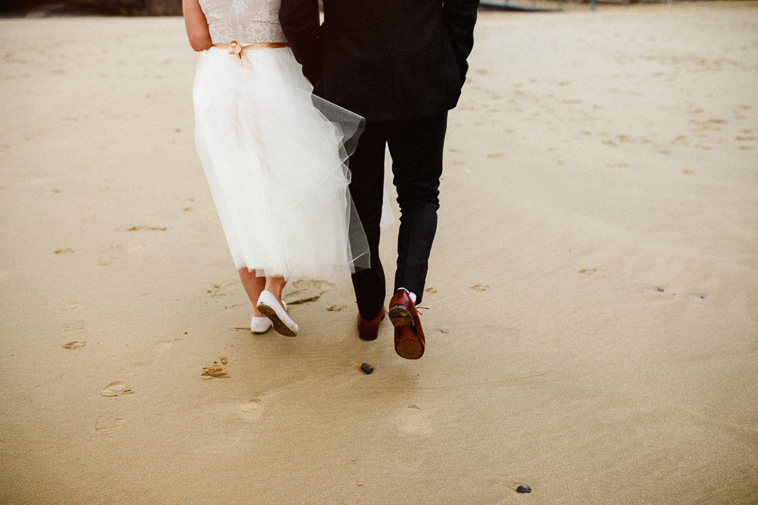 Shawn wore a tweed grey suit from Ted Baker, tie and shirt from RW&Co and brown shoes from Steve Madden. 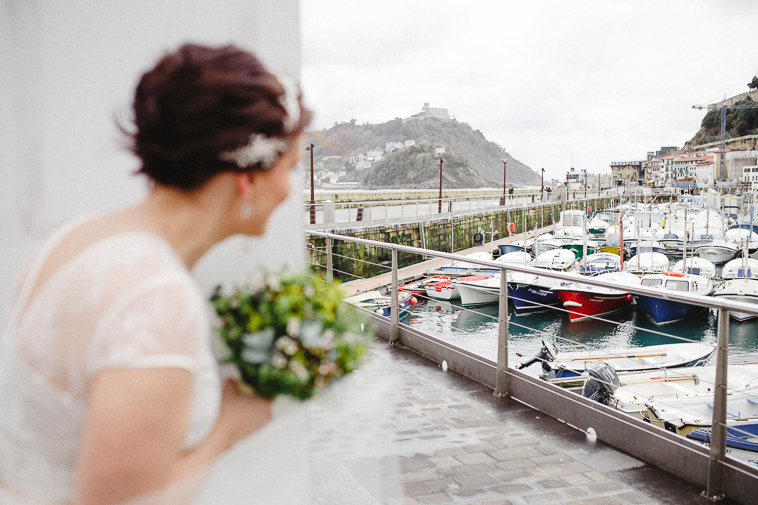 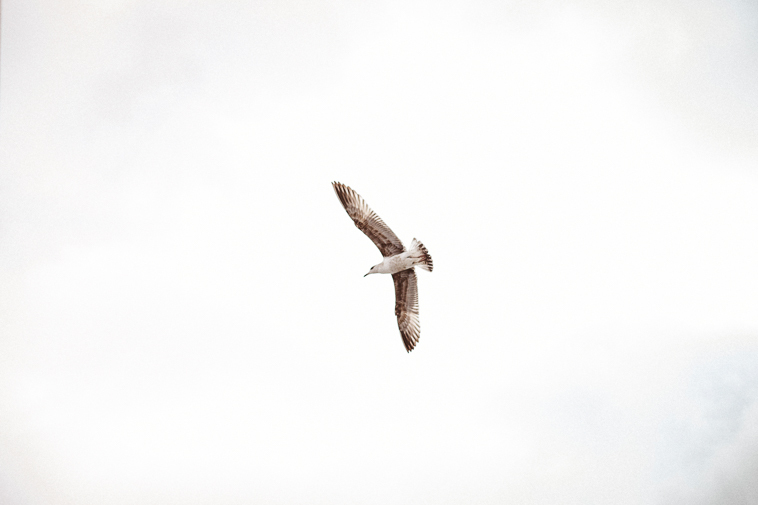 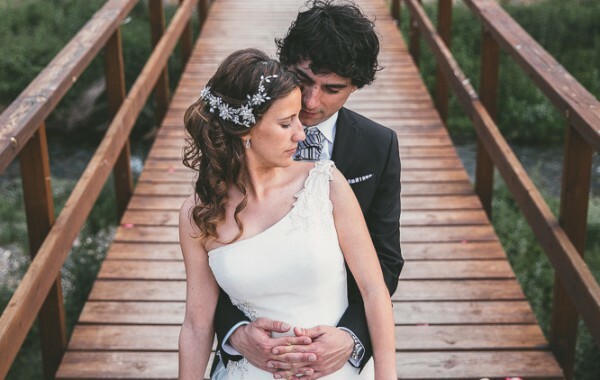 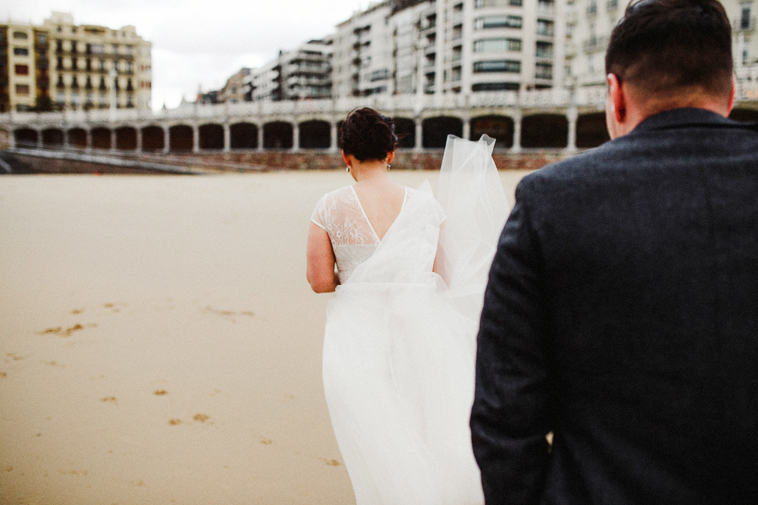 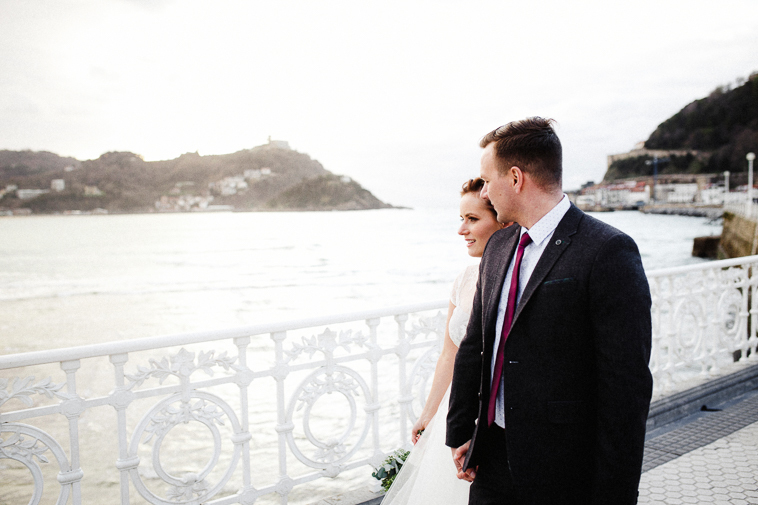 If you like our work and you are planning a destination wedding in San Sebastian or perhaps you’d like to get married in San Sebastian, please don’t hesitate to get in contact with us for more information. 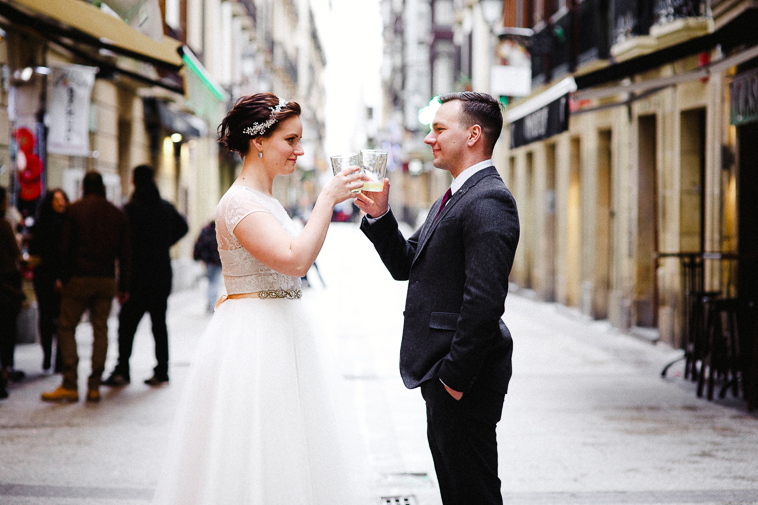 Kelly y Shawn vinieron desde Canada para celebra su boda en San Sebastian. 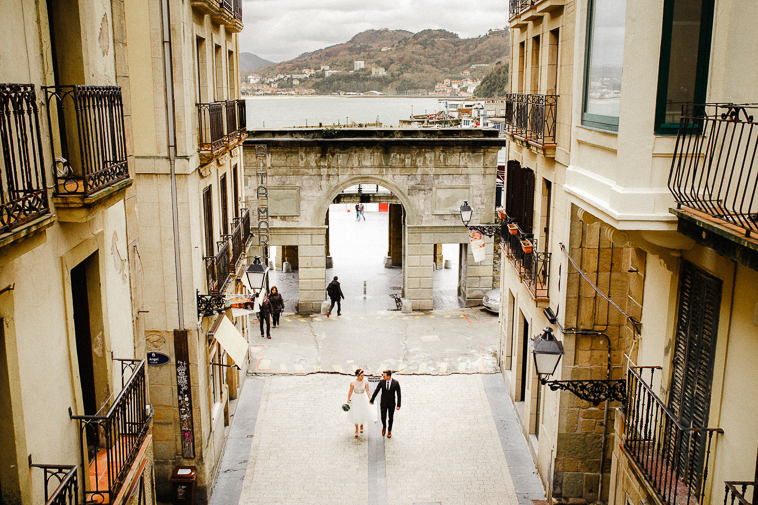 Ya habían visitado anteriormente el Pais Vasco y se enamoraron sus paisajes, su gente y del respeto que estos tienen por sus productos locales y sus métodos tradicionales. 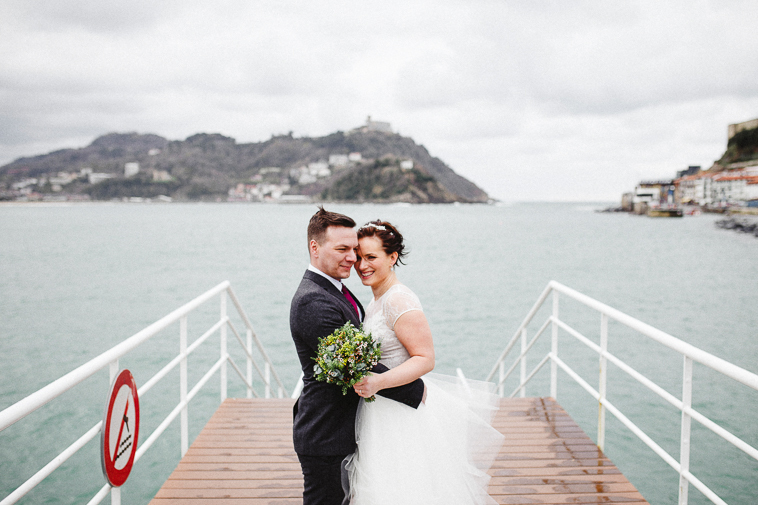 Importadores de productos gastronómicos vascos en su país natal, decidieron hacer una ceremonia en una sidrería, pero no antes sin dar un paseo con nosotros por la ciudad. 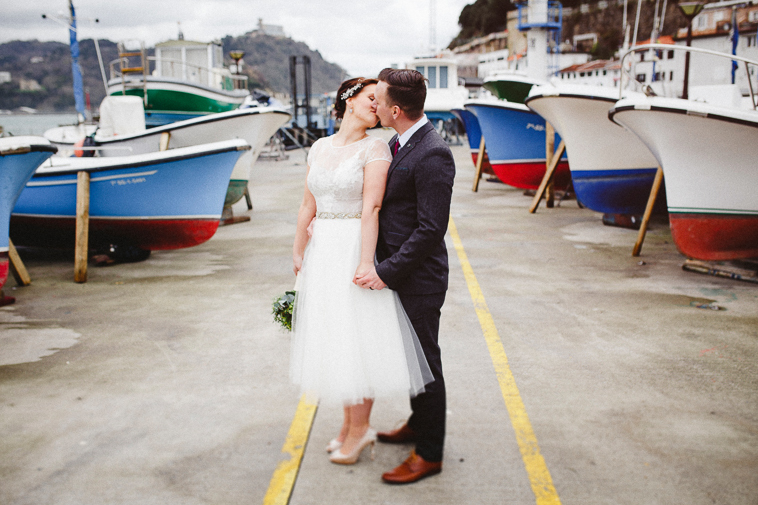 Empezamos con un First look en el puerto de San Sebastian para después adentrarnos en la parte vieja y degustar los riquísimos pintxos acompañados con un vaso de sidra y al final terminar con un precioso atardecer en la playa de la Concha. 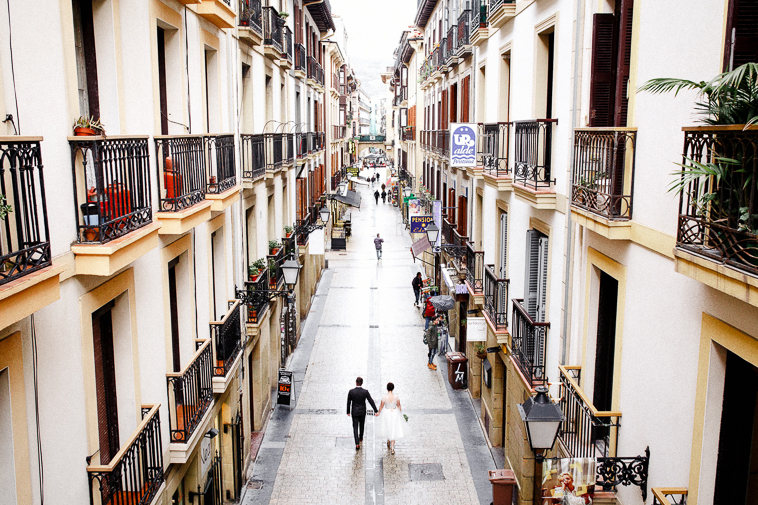 ¿No os parece un plan estupendo, el aprovechar una sesión de fotos para conocer una ciudad? 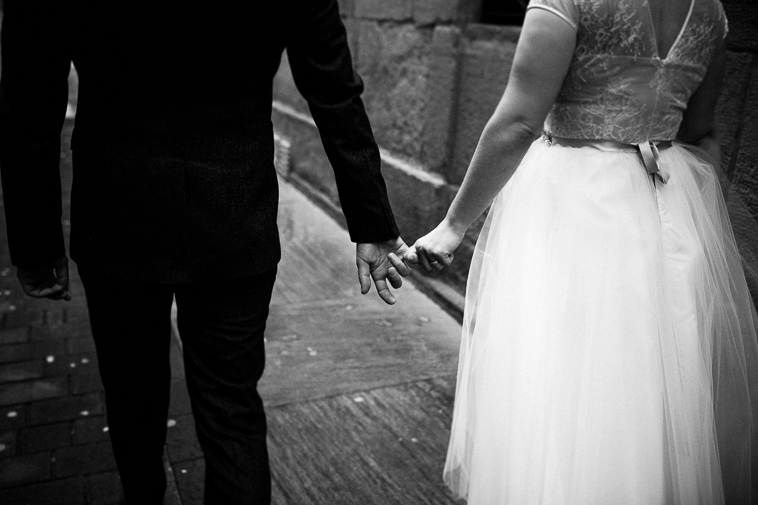 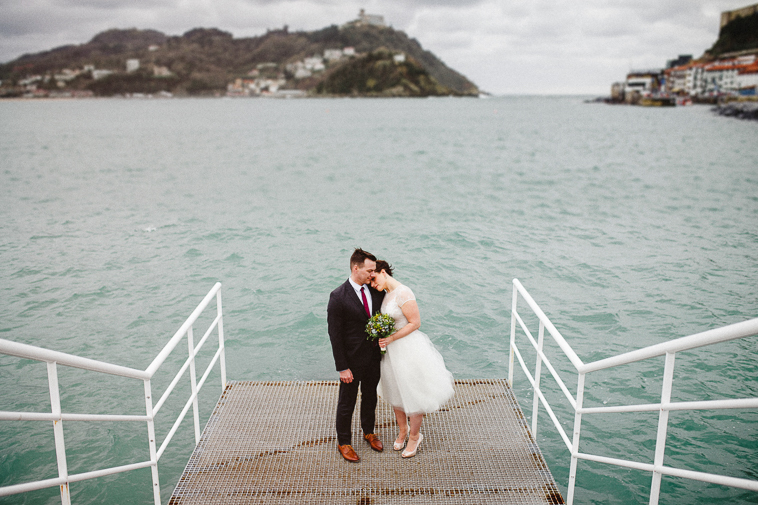 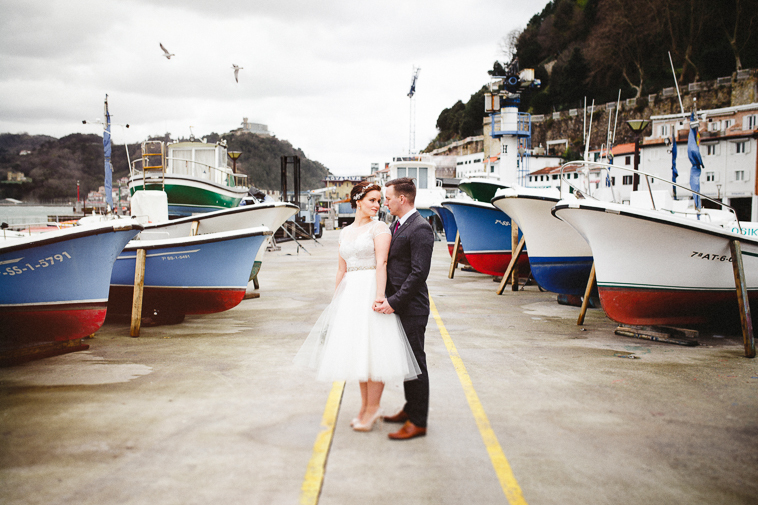 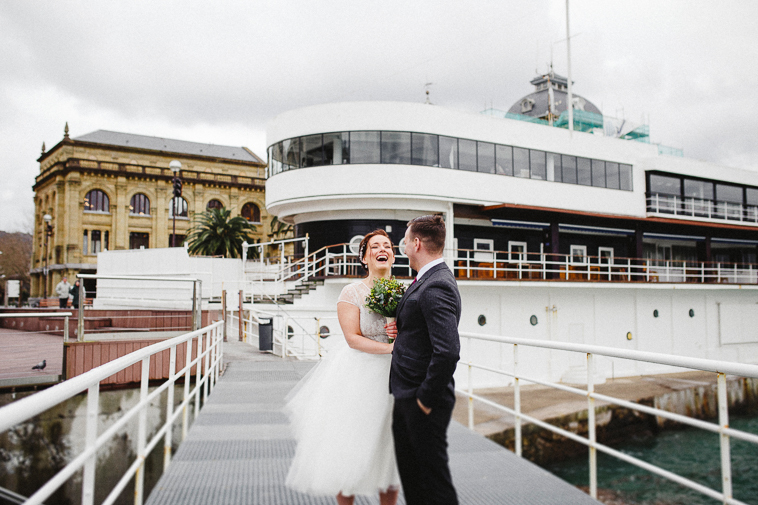 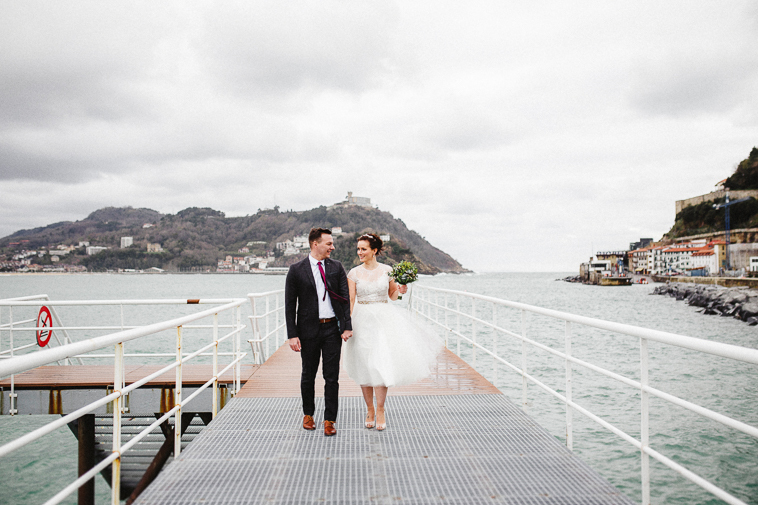 Como fotógrafos de bodas en San Sebastian nos encanta que haya parejas que escojan otras ciudades para celebrar su boda. 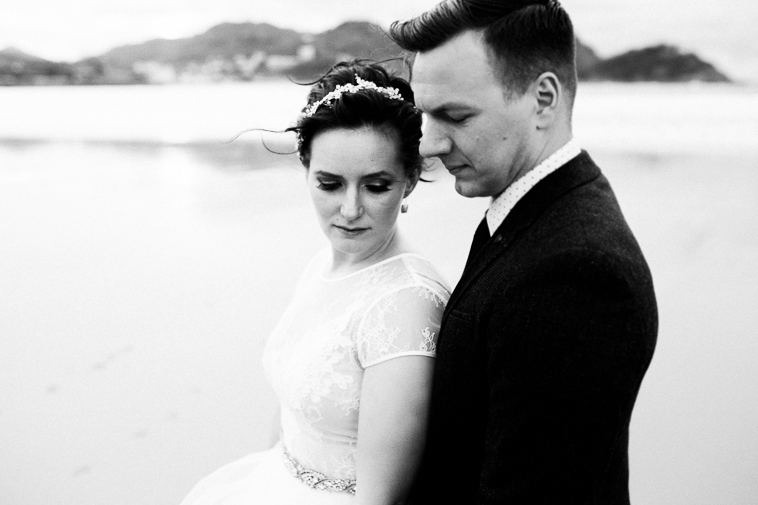 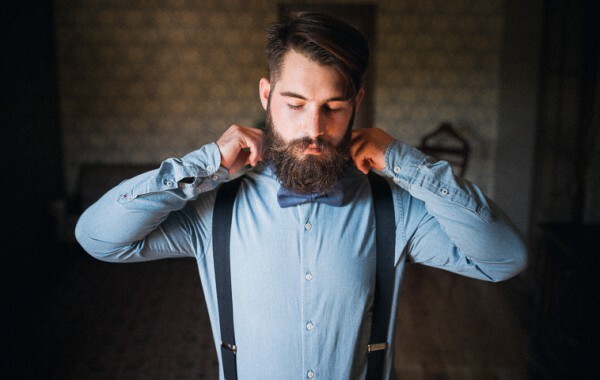 Si estáis planeando celebrar vuestra boda en cualquier parte de el mundo y os gusta nuestro trabajo, no dudéis en contactar con nosotros para mas información.